Airzone standard motorized plenum with neck for mechanical adjustment to the ducted units of the main manufacturers. It includes dampers of 200 mm in diameter and it also has a separate input for the controlled mechanical ventilation. Reduced in size to fit with low profile units. 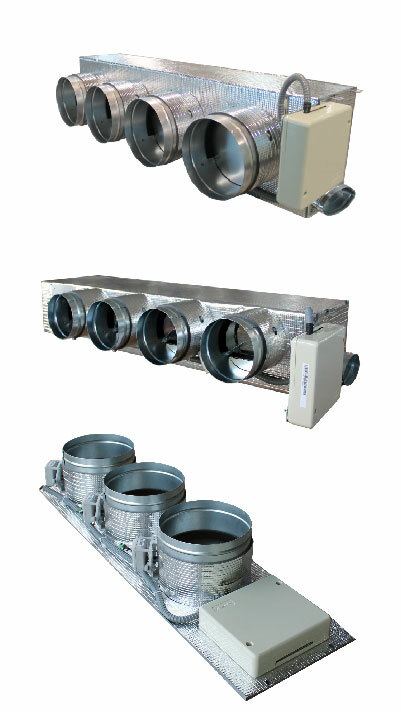 It includes dampers of 150 mm in diameter and it also has a separate input for the controlled mechanical ventilation. Integrated zoning system for round dampers available with several specific configurations. Designed to be put in the air supply mechanism of the AC unit. All the dampers are mounted and wired in a module that fits mechanically to each model of the main manufacturers in the market. The Easyzone motorized plenum is insulated and incorporates all the necessary fixings elements to complete the installation. It also incorporates a mechanism of regulation in the dampers to adjust the maximum flow or to maintain a minimum of air supply.